i think this is what our son will look like. 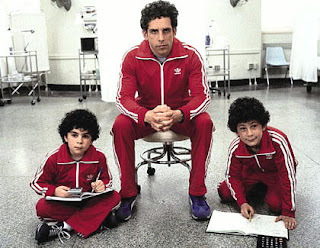 with doug (ben stiller) in the middle. maybe we will have another and re-create this photo. this is from the Royal Tenenbaums. doug just left for a jog wearing this outfit in black. today is the last week of my first trimester! i am 23 weeks and getting bigger every day. last weekend, we bought a new camera. doug's been reading up on all of its features. we took some pictures last night. i would post them now, but i dont know how to download them yet. i will get them up here tomorrow. ive been pretty tired these last few weeks... super tired at work. and cant seem to remember anything! i know i should be exercising, but im not. im just walking to and from work (which is about 45 mins total a day) but im having restless legs (aka "jimmy legs" doug says is from seinfeild) at night. we watch tv or a movie and i have to stand for most of the evening. doing squats and stretches. ugh! but it helps, so once i get to the bed, i can fall asleep quickly....i just dont stay asleep!!!!! beth sent some books last week, which made me tear up just looking at the covers~ i havent opened them yet. i am going to start reading to the baby at night. i just found out that hoboken has a 'moms group' and there are tons of new mom activities to do in our little town!!!! there are also tons of classes for toddlers, etc.